Settle into your designer chair and touch the sea. The old Farol guest house, once a 19th century mansion owned by the Count of Cabral, was carefully refurbished becoming the current Farol Hotel, adjacent to the marina in the historical centre of Cascais. The hotel undergone an interior and exterior renewal, aimed to reformulate its image while maintaining its attractive design, now focused on black and white tones. The furniture surrounding the salt water pool, garden and lounge bar is modern, minimalist and very comfortable. These areas invite you to rest and relax, and the stunning sea view contributes to the mission! We recommend watching the sunset to the sound of music and the taste of creative cocktails in the bar On the Rocks, and later trying the suggestions of The Mix restaurant, renewed with the same attractive and minimalist style. Take advantage of the privileged climate, venture out to the different beaches that dot the coastline and have fun in the relaxed atmosphere of the village of Cascais. Accept the Farol Hotel´s invitation. 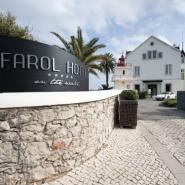 Farol Hotel is located in the historical centre of the village of Cascais, adjacent to the marina. Follow the A5 to the end, turning at the last Cascais exit. Drive straight ahead, crossing two roundabouts in a straight line. Upon reaching the third round-about, turn right. Continue driving straight ahead, through several roundabouts, until reaching the sea. Turn left, heading along the coast until reaching the first edifice placed between the sea and the road. This edifice is the Farol Design Hotel. There are no extra beds for adults.